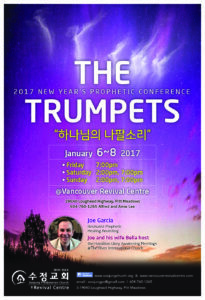 This new year’s conference, the trumpets, with Joe Garcia starts on Friday January 6 to 8 sunday. Anticipate the great God’s mercy and love, His favor and grace on you life, let’s march in the year 2017 with His Presence. 2016년도 여름 해밀턴 부흥을 이끄신 Joe Garcia 목사님을 모시고 있습니다.